Prostate cancer care is set to be transformed by the use of the first personalised medicine to tackle the disease. British scientists are leading a global trial of a daily pill that uses a man’s genetic make-up to undermine a tumour’s defences. Early results suggest a third of victims of advanced prostate cancer could benefit from the new class of drugs called PARP-inhibitors – potentially helping 3,000 men a year. 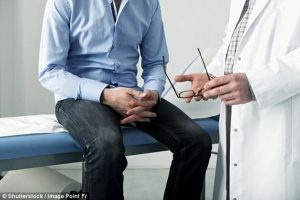 Experts at the Institute of Cancer Research in London have now embarked on a phase three trial of one of these drugs, called olaparib, involving 350 patients with prostate cancer. British scientists are leading a global trial of a daily pill that uses a man’s genetic make-up to undermine a tumour’s defences. If the trials are successful it will pave the way for the first personalised, or ‘precision’, medicines for prostate cancer. These enable doctors to accurately target cancers according to the patient’s genetic make-up, rather than the ‘one-size-fits-all’ approach provided by chemotherapy and hormone therapy. Personalised medicine has shaken the world of breast cancer and ovarian cancer treatment in recent years. Olaparib was made available on the NHS for ovarian cancer two years ago after scientists showed it increased survival by 11 months. Experts believe prostate cancer research is lagging ten to 20 years behind research for breast cancer. But the breakthrough could finally bring it up to date. The Daily Mail has been campaigning for nearly 20 years to end needless prostate deaths through earlier diagnosis and better treatments. Last week official figures revealed that the disease has become a bigger killer than breast cancer for the first time. His earlier trial of 49 men, published in 2015 in the New England Journal of Medicine, suggested a third of men with advanced ‘metastatic’ cancer could benefit from the treatment. They saw their cancers stop growing and tumour cells in the blood fall. Levels of PSA – the blood marker used to track the progress of prostate cancer – also dropped by up to 96 per cent. Some 16 of the 49 men had detectable faults in genes that play a role in repairing damaged DNA, including BRCA 1 and 2. Of these, 14 responded well to olaparib. Last year the team embarked on a much larger phase three trial – the type needed to secure a safety licence – which recruited men with prostate cancer who had similar detectable gene defects. Professor de Bono said 150 of 350 men have already been recruited to the trial, which is set to run until 2020. Each year more than 47,000 men are diagnosed with prostate cancer in the UK. Of these 9,000 have metastatic cancer, which means it has spread from the prostate to other parts of the body. Dr Iain Frame, Director of Research at Prostate Cancer UK, said: ‘Every man’s prostate cancer is unique to him and so not surprisingly the way men respond to treatments varies enormously. ‘The one-size-fits-all approach to treatment is not fit for purpose and as such a key focus of prostate cancer research is to identify what drives an individual man’s cancer, and which drugs will work best to stop it in its tracks.